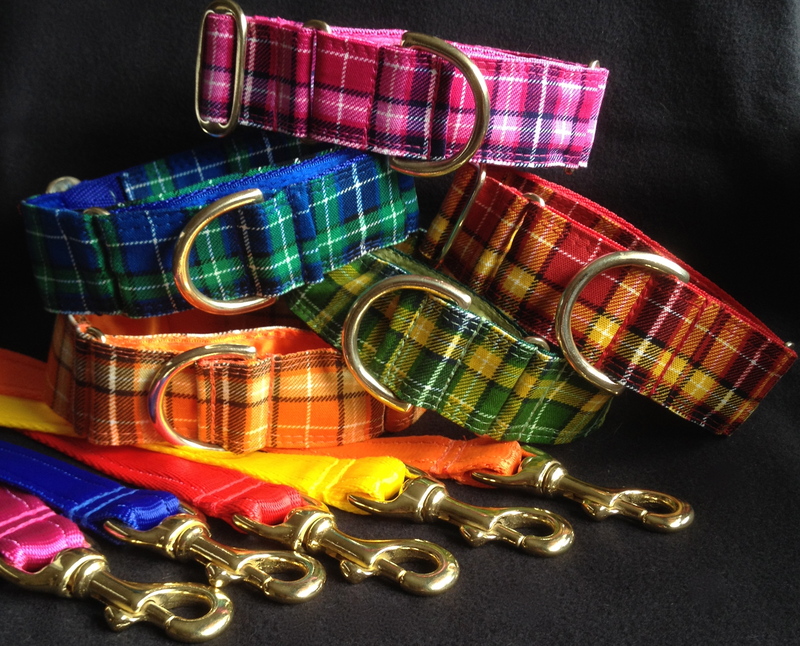 Our Collars are made from top quality webbing lined with satin, covered with a range of luxurious trims & finished with solid brass fittings. We purchase the best materials from suppliers worldwide to ensure that Boomerjacks leads & collars are the best quality that they can be at affordable prices. 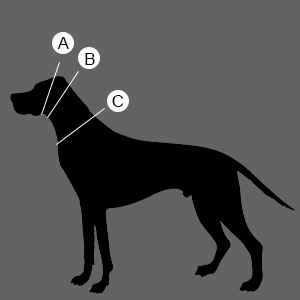 To assess which collar size you will need, take three measurements; (A) From under the chin up around the front of the ears. (B) From under the chin up around the back of the ears. (C) Around the neck where you wish the collar to sit. Use the largest measurement to determine the size collar suitable for your dog. Martingale Dog Collars are fitted to the exact size of the dog's neck when the collar is pulled closed. Properly fitted, the collar will be comfortably loose when not in use. 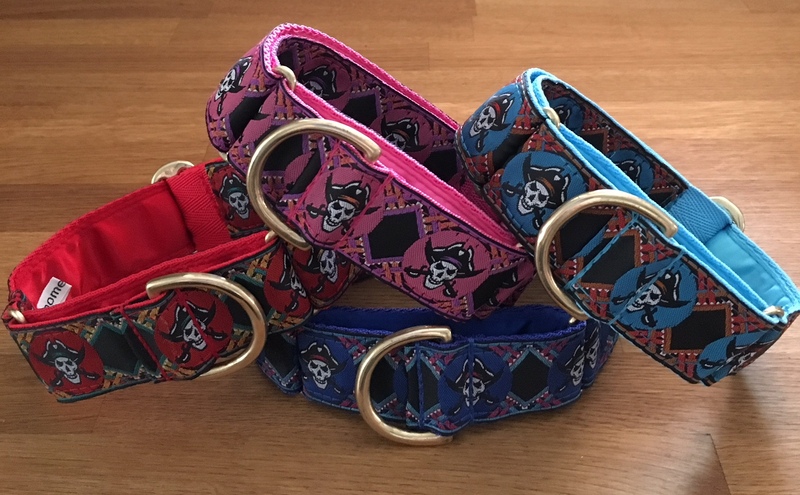 When the Martingale control loop is pulled, the two slides (hardware on the small control loop of the Martingale Collar) should pull close together without choking your dog.These collars are supplied with solid Brass furniture. Clip Collars are attached around your dogs neck using a black curved side release clip that contours your dogs neck for maximum comfort. These collars are supplied with solid Brass furniture. Half Check Collars are fitted to the exact size of the dog's neck when the collar is pulled closed. Properly fitted, the collar will be comfortably loose when not in use. When the Half Check Chain is pulled, the two rings (hardware on the chain loop of the Half Check Collar) should pull close together without choking your dog. These collars are supplied with chrome furniture. If you would like me to re-use Boomerjacks Collar hardware from your old collar, please return brass to me to the address on the contacts page with an order for the new collar. You will then be able to deduct 20% from the cost of the new collar. The collar has to be the same width as before so I can re-use your brass! 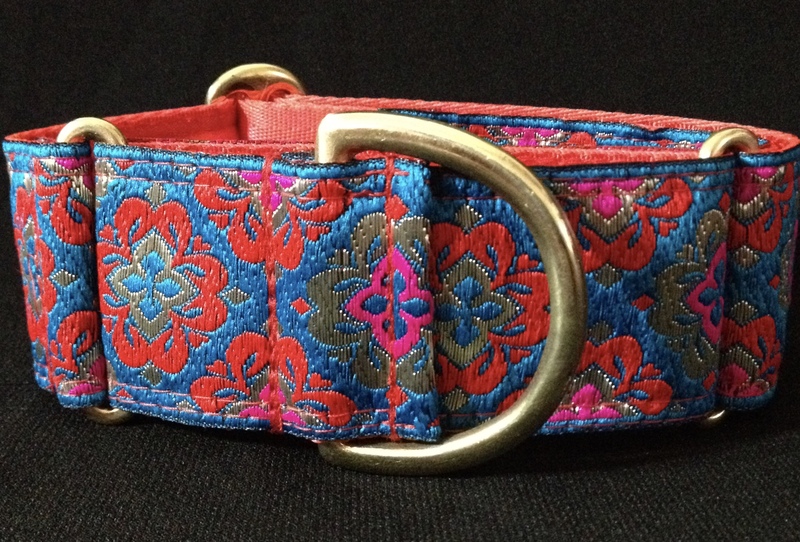 Please do not send me your old collar in its entirety, just the brass please!